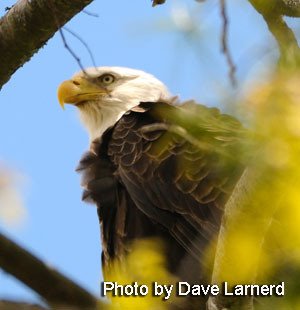 Probably the most well known of all the raptors, our national bird... the Bald eagle is also the most recognizable. Adult males and females both sport the familiar white head, neck and tail with a bright yellow beak and feet... these develop when they reach sexual maturity. Prior to that, as a juvenile, they will have a mixture of brown and white from head to toe with youngster having a black beak. Standing just under 3 feet, adults can have a wingspan of 6-7 feet and weigh up to 14 lbs. Females usually being heavier and larger than males. Currently off the endangered species list, bald eagles are still protected. The use of pesticides like DDT prior to 1972 took a toll on eagle populations. These chemicals, that collected in the fish eaten by the eagle, limited their reproduction by weakening their eggshells. The restriction of DDT use in 1972, along with their protected status and reintroduction programs, led to a rebound in eagle numbers. Their status has since changed from endangered to threatened. Although numbered to nearly a half million in the U.S. during the 1700's, those numbers dropped to only about 500 nesting pairs in the continental United States. Currently, they boast over 5000 nesting pairs with a total of 70,000 across North America. The greatest number being found in Alaska and Canada. They are known to eat carrion and steal food from other birds, but they are excellent hunters as well. There hunting is primarily "fishing" as they are able to catch fish by swooping down and grabbing them in their talons near the surface of lakes and streams. Because of their love for fish they have been often called sea eagles. The male and female work together to build a very large nest of sticks, usually located at the top of a tree. These nests can measure up to 8 feet across and weigh as much as a ton. Nests are added to and reused each year. Once paired, male and female remain together until one mate dies, the surviving bird will then find another mate. Mating can occur anywhere from September until April. A male and female will soar high in the air then begin a dive, locking talons and decending in a series of somersaults. Females rarely produce more than one or two offspring per year in early summer. Twelve weeks later young fledglings emerge from their nest and the protection on their parents. At 20 weeks are ready to fend for themselves. Benjamin Franklin lobbied for the wild turkey as the countries national bird, but was out voted and the Bald Eagle was named such in 1872. They are the only eagle confined to North America. The term "bald" comes from the original meaning "white", not the current meaning of "without hair". Harassing, disturbing or injuring a bald eagle is a federal offense and carries a penalty of up to $20,000 and/or one year in jail.